Wedding bells are ringing out on Keppoch this summer as Boston Bessie Beaton is coming home with the Irish lad she wants to marry. Since the church blew down in a recent gale, the priest has agreed to hold the wedding in the mountain’s ceilidh house with Maggie and Joe MacLean hosting the big do. Being in Boston these last few years, doing a little modeling and a lot of working in a fish plant, Bessie has acquired a few notions about the makings of a splashy wedding. That might be great altogether except by the time Bessie lands on the Keppoch, Maggie has put herself in charge of just about everything from music to menu. Expect a few sparks to fly. It is a busy time on the mountain with cattle to bless, Gaelic stories to tell and an interfering Mountie to be put in his place but everybody pitches in for the wedding. The first going off, there’s the extremely serious issue of finding the necessary refreshments since distributor Michael Lauchie went to jail. Then there’s the young girls dreaming of romance, the older ladies waiting on hats ordered from the catalogue and bachelor Billy the Bochan debating whether a wedding is a big enough occasion to warrant washing his shirt. As young and foolish as Bessie is, she is a Keppoch girl, born and bred, so you may be sure the neighbours won’t let the Irish lad and his mother go back to Boston without a heaping helping of highland hospitality. 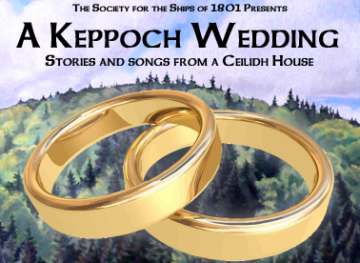 The pipes, the fiddles and the dancers are lined up and raring to go so squeeze onto the stairs or have a seat on the woodbox as you don’t want to miss a Keppoch wedding.